1. Capital of the government of the same name in White Russia; situated on the Dnieper. Though the city was well known as an important trading center as early as the fourteenth century, the first mention of Jews there occurs in a document dated 1522, wherein King Sigismund awards a lease, for a period of three years, of the various taxes of Moghilef to Michael Jesofovich, the noted merchant of Brest. This lease was renewed three years later, and subsequently taken up by the Jesofovich family and other Jewish merchants, as appears from a number of documents. Toward the end of the sixteenth century Jews had probably settled in Moghilef in considerable numbers, although there are no documents extant to show that they had a well-organized community at that time. In 1583 Affras Rachmaelovich, a prominent Jewish merchant of Moghilef, carried on an import and export trade with Riga and Lublin. 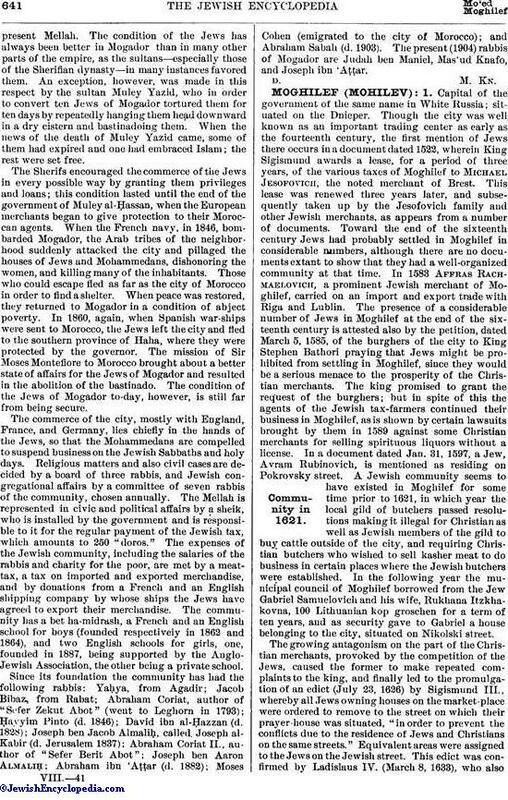 The presence of a considerable number of Jews in Moghilef at the end of the sixteenth century is attested also by the petition, dated March 5, 1585, of the burghers of the city to King Stephen Bathori praying that Jews might be prohibited from settling in Moghilef, since they would be a serious menace to the prosperity of the Christian merchants. The king promised to grant the request of the burghers; but in spite of this the agents of the Jewish tax-farmers continued their business in Moghilef, as is shown by certain lawsuits brought by them in 1589 against some Christian merchants for selling spirituous liquors without a license. In a document dated Jan. 31, 1597, a Jew, Avram Rubinovich, is mentioned as residing on Pokrovsky street. A Jewish community seems to have existed in Moghilef for some time prior to 1621, in which year the local gild of butchers passed resolutions making it illegal for Christian as well as Jewish members of the gild to buy cattle outside of the city, and requiring Christian butchers who wished to sell kasher meat to do business in certain places where the Jewish butchers were established. In the following year the municipal council of Moghilef borrowed from the Jew Gabriel Samuelovich and his wife, Rukhana Itzkhakovna, 100 Lithuanian kop groschen for a term of ten years, and as security gave to Gabriel a house belonging to the city, situated on Nikolski street. The growing antagonism on the part of the Christian merchants, provoked by the competition of the Jews, caused the former to make repeated complaints to the king, and finally led to the promulgation of an edict (July 23, 1626) by Sigismund III., whereby all Jews owning houses on the market-place were ordered to remove to the street on which their prayer-house was situated, "in order to prevent the conflicts due to the residence of Jews and Christians on the same streets." Equivalent areas were assigned to the Jews on the Jewish street. This edict was confirmed by Ladislaus IV. (March 8, 1633), who alsoprohibited the Jews from building baths and breweries within the city limits. This and other documents show that the populace was being incited against the Jews by the burghers and the clergy. In 1639 the burghers reported to the city council that a Christian servant who had been employed for ten years by the Jewess Lyuba Josefova, had died under suspicious circumstances and that the Jews had buried her without giving notice of the funeral to her relatives. The investigation revealed that the deceased had been drinking heavily in the monastery and had fallen unconscious in the street near the house; that Lyuba with the aid of the servant's sister had carried her into the house, where she died soon after; and that the son of the deceased, accompanied by other relatives, had buried her, a fact corroborated by numerous witnesses. Other unfounded accusations were repeatedly made against the Jews of Moghilef, especially as to their responsibility for the frequent conflagrations occurring in the city. 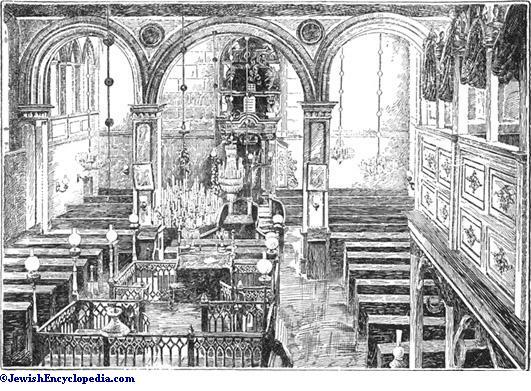 The enmity toward the Jews found expression in a riot which occurred on the Jewish New-Year's Day, Sept. 21, 1645. Led by the burgomaster, Roman Rebrovich, an armed mob attacked the Jews, who had gone to the River Dnieper for the observance of the religious custom of "Tashlik"; the mob wounded men and women, robbed them of their jewelry, and attempted to throw them into the river. The case was carried to Prince Radziwil, the chief marshal of the duchy of Lithuania, whose influence enabled the burgomaster to escape punishment. This incident, one of many, throws light on the popular attitude toward the Jews a few years before the uprising under Chmielnicki. The Jews of Moghilef apparently escaped the first fury of Chmielnicki's Cossacks in 1648; and they benefited in the following year by the renewal of the charter of privileges granted to many Lithuanian communities by King John Casimir (Feb. 17). The security of the Moghilef community was, however, of short duration. In 1654 the city was annexed to Russia, and by order of the czar Aleksei Mikhailovich in response to a petition of the Moghilef burghers the Jews were commanded to leave (Sept. 15, 1654). In spite of this order they remained in Moghilef (probably as the result of bribery of the local officials), but they paid dearly for so doing. In 1655 most of them were massacred by the Russian soldiers outside of the city walls, where the Jews had assembled by order of the Russian commander Poklonski (see Jew. Encyc. iv. 286b, s.v. Cossacks' Uprising). The only Jews spared were those who had not yet left the city, and who, fearing a similar fate, had declared their readiness to accept baptism. The Father Superior Orest, commenting on this incident in his memoirs, laments the fact that after the war, when the danger to the Jews had passed, most of the converts returned to Judaism, only a tenth part of them remaining Christians. In 1656 Moghilef was again under Polish rule; and the old charter of privileges was renewed by King John III. In the memoirs of Orest, referred to above, mention is made also of Shabbethai Ẓebi (whom Orest calls "Sapsai Gershonovich"). The first rabbi of Moghilef and of "the Russian province" of whom record is preserved in Jewish documents, was Mordecai Süsskind Ruttenburg, who was living in Moghilef in 1686, as appears from his responsa (i. 44b; Amsterdam, 1746). He was probably among the first (if not the first) of the rabbis of the Moghilef community after permission was given the Jews in 1678 to reside anywhere in the city. For the next century the Jews of Moghilef remained secure under the protection of the Polish crown, with the exception of the period covered by the Swedish war, when Moghilef was for a time on the battle-ground between the Swedes and the Russians. Orest describes in his memoirs the entry of Peter the Great into Moghilef, when the Jewish inhabitants together with the rest came to welcome him, and presented him with a live sturgeon. (After a photograph. )Under Russian Rule. With the partition of Poland in 1772 Moghilef became a part of the Russian empire. Catherine II. visited the city in 1780 and was received by the Jews with expressions of joy. They decorated the public square with flowers and erected an arch bearing the inscription "We rejoice as in the days of King Solomon." They also engaged a band of music to play in the daytime and in the evening. During the successive reigns of Catherine, Paul, and Alexander the prosperity of the community increased. The Jewish merchants of Moghilefwere especially prominent as traders in timber, hemp, and grain, which were sold in Riga, where a number of Jews of Moghilef settled later. Important commercial relations were maintained also by way of the Dnieper with Kiev and Kherson. Toward the middle of the nineteenth century and later the Jewish merchants of Moghilef became prominent also as government contractors, and carried on an extensive trade with Moscow. 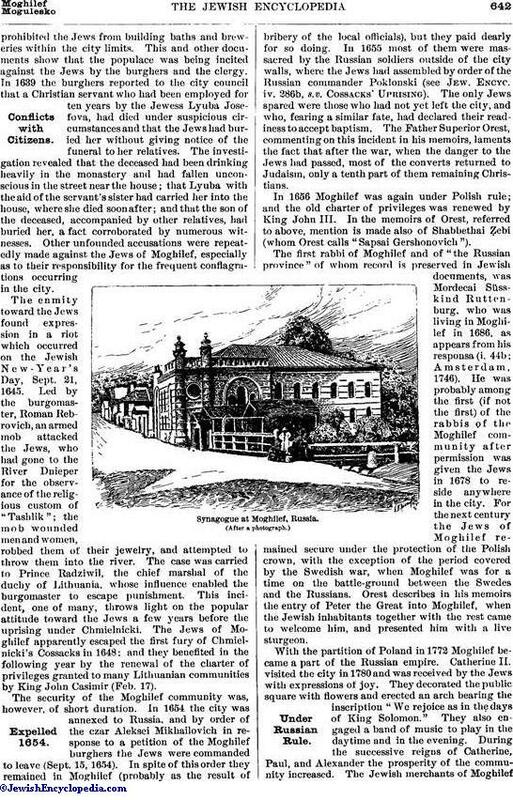 In 1897 the Jews of Moghilef numbered 19,398 in a total population of 43,106 The city had two synagogues and about forty houses of prayer; thirty-five ḥadarim and three yeshibot; a Jewish hospital and a number of dispensaries; Jewish elementary schools for boys and girls; a Talmud Torah; and the usual Jewish charitable organizations. By far the greater portion of the Jews of Moghilef are artisans earning scanty wages. Since the construction of the railroad, which did not touch Moghilef, the prosperity of the city has declined. Mstislavski, in Vaskhod, 1886, ix. and x. 2. City in the government of Podolia, Russia; situated on the Dniester; it has a population of 22,093, of whom 14,000 are Jews. The latter include 3,306 artisans and 131 day-laborers; 61 are employed in the shops and factories. 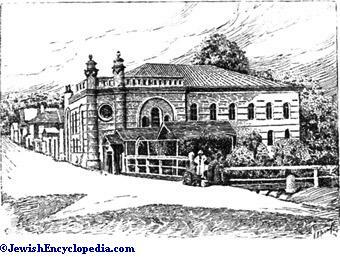 The Jewish children are taught in fifty-eight ḥadarim (700 pupils), in the Jewish school with its industrial department (140), in a private school for girls (68), and in the city school (130, the total being 320). Among the charitable institutions is a hospital. In 1897 there was founded a loan association which lends small sums of money without interest to petty traders and artisans. A society for aiding the poor, founded in 1899, gives special attention to supplying artisans with proper tools and to aiding them to dispose of their wares. Poverty is steadily increasing, leading to increased emigration. During the war between the Russians and the Poles many Jews of Moghilef were killed by the Cossacks and the Russian troops (1664). Regesty i Nadpist, vol. i., No. 1021, St. Petersburg, 1899. 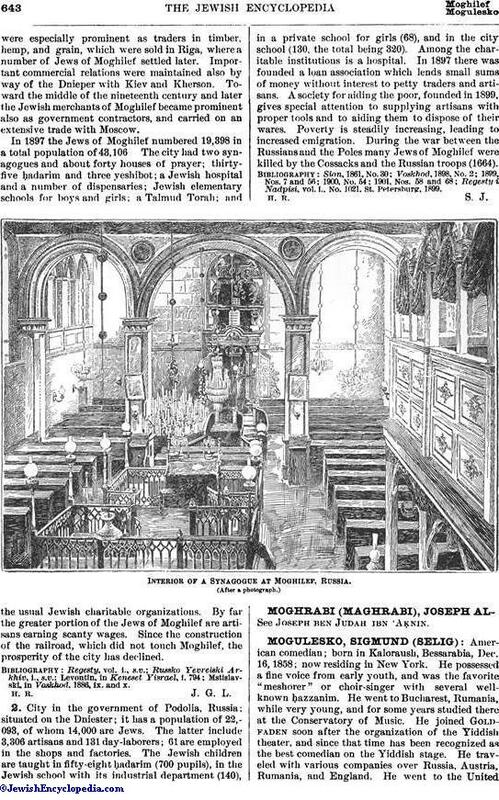 Interior of a Synagogue at Moghilef, Russia.